Interested in learning how to get a reclassification or raise, how to make your workplace safer, or in becoming a union steward or bargainer? 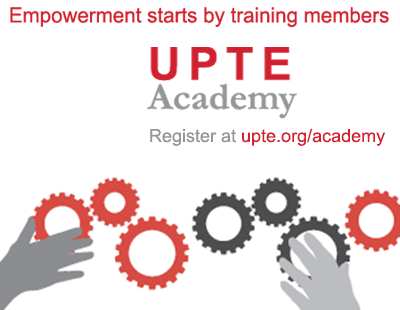 Take advantage of the UPTE Academy, which provides free training to union members. In their Labor Notes blog, AFSCME leaders outline what it took to beat back UC’s pension takeaways and win strong contracts that protect staff and prevent contracting out. AFSCME represents UC’s patient care techs and service workers systemwide. UPTE’s three represented units of researchers, technical employees and health care professionals won similar provisions protecting single-tier pensions and providing contract improvements and fair raises. State funding cuts to the University of California and other public educational institutions, have “fundamentally altered how higher education costs are shared” between the state and students and their families, a cost shift that “undermines California’s commitment to higher education and potentially puts the state’s economic future at risk.” So says a new report out from the California Budget Project, a nonprofit, nonpartisan policy organization. Among the fascinating facts in the report: spending on the state’s prisons has risen three-fold, while spending on higher education has nearly been sliced in half. Concerns about diminishing opportunity for California students to attend UC, while out-of-state enrollments are climbing, have led one San Jose family to launch a petition to keep California’s universities for Californians. 30% of freshman at Berkeley and Los Angeles are from outside California, up from 10 percent just four years ago. Other families are finding it increasingly harder to send their children to UC campuses, as this Inside Higher Ed columnist reflected. UC president Janet Napolitano has rejected UCSF’s proposal first floated two years ago to grant it more autonomy within the UC system. "UCSF is firmly part of the system and will remain so," said Napolitano. Got some spare time for a little reading? Try the Digital Public Library of America, the story of which is told in this week’s New York Review of Books. As academics at institutions such as UC are pushing publishing innovations to save money, libraries are changing, and some have a welcome array of public domain web-based resources available at no cost to anyone with internet access.